This bronze equatorial dial is about four feet in diameter with a 6 inch equatorial band containing raised Roman hour numbers from 5am to 7pm. The band is graduated every ten minutes and is offset by approximately 8 minutes to read Eastern Apparent Time. The gnomon is a simple arrow without nodus and the dial does not have an analemma. The octagonal dial base is made of brown marble panels approximately 5 feet high with a smaller octagon on top approximately 1 foot high that supports the dial. Each octagon is capped with thick granite. The base is a mausoleum, with alternate octagonal sides each containing 8 crypts. A 7 inch diameter brass horizontal dial with 3.5 inch high brass gnomon on a weathered octagonal stone pedestal. Reported to be contemporary with Mary Ball Washington's occupancy of this house in the 1780s. Dial sits atop a stone pillar. A small bronze horizontal dial on an 18 x 18 inch block of marble. Pedestal of Tennessee marble rests on the back of a carved tortoise. The sides of the square block capital are deeply carved with oak leaves and acorns. When the dial was seen in 1998, the dial was not aligned to north. Inspection of the dial face shows that it is not designed for the site latitude of 39? but higher in latitude, perhaps even 44?. It is thought the dial might have been purchased by Edith Eustis, wife of William Cocoran Eustis who owned the Oatlands estate for the first part of the 20th century. The maker's signature, "fecit," and a crown is spurious, since any legitimate dial maker would use name or initials. The date of 1717 is not convincing as it does not match the design of the dial. And, if purchased by Mrs. Eustis, it is probably not French or Italian, since the compass rose is delineated by the English letters for north, south, east and west. An internal cylindrical dial built in a 16 foot diameter, 48 foot tall farm silo now located on a public golf course. The rim of the open top of the silo provides an elliptical shadow line on the inner wall of the silo. This is marked out with red hour lines and black date lines using the low point of the shadow on the wall as the time marker. The artwork has "three panels representing the continuity of man's perceptions of space: past, present, and future. In an abstract sense, the sundial represents the scientific, emotional, and philosophical struggles and triumphs of mankind." Contact Tanyard Country Club Golf Pro Shop at 540-967-1889 to ensure the silo door is open. A replica of Jefferson's lost dial, which he recounted in 1817, "My dial captivates every body foreign as well as home-bred, as a handsome object & accurate measurer of time." Made according to Jefferson's design, the replica dial is a 10 1/2 inch painted wood sphere with horizontal lines drawn for the equator, Tropics of Cancer and Capricorn. Longitudinal lines are drawn between the two tropics to indicate the hours of the day. A gnomon fixed to the poles swings around the globe until it casts the smallest meridian shadow. The original sphere was made of black locust wood but the replica is mahogany because it is "more durable, stable and easier to find." The base was originally a model of a capital, the top part of a column, that Latrobe had designed for the U.S. Capitol. It was unique, featuring ears of corn in motif. When Jefferson received the base from Latrove, "it looked bald for want of something to crown it" and so Jefferson designed a globe that "might be made to perform the functions of a dial." This vertical dial declines 28 degrees east, and was commissioned as educational artwork for the new Discover STEM Academy (Magruder Elementary School). The dial is 21 feet wide and 14 feet tall consisting of quarter inch by 3 inch aluminum planks for the hour lines and 4 inch aluminum pieces for the solstices and equinox lines. The hour lines are adjusted for longitude, with stainless steel Arabic numerals showing the time from 6am to 2pm at the bottom of each hour line. The gnomon is a 2 inch rod 40 inches long with a 6-inch nodus ball set back slightly from the rod end. The gnomon is held to the wall by an 18 inch yellow sun. A modernistic seven foot diameter flagstone horizontal dial with hour lines. The design features a gnomon of folded stainless steel plate. Gnomon is truncated too short for shadow to reach edge of dial face. See "Sightings" in NASS Compendium Vol. 6 No. 4, Dec 1999. 'Built in 1981 after an article in Scientific American (Dec 1980 "The Amateur Scientist") described a computer program for building a gnomonic dial with analemma hour lines. The dial was painted on the museum's parking lot, using a ball atop a 25 ft aluminum flagpole as the nodus. Semi-annual analemmas were painted in different colors, allowing correction for the equation of time. The dial was refurbished June 1992. Bronze horizontal dial 36 inches in diameter. The sundial was constructed in memory of their beloved scoutmaster Sydney "Mike" Mitchell. The $3000 cost was donated from former scouts and friends. The Boy Scout Law is cast around the outer diameter of the sundial. Various Scouting awards that the Scoutmaster received are also cast into the sundial. 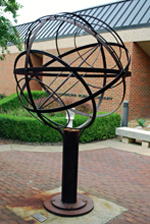 This armillary is constructed of welded carbon steel narrow bands approximately 4-feet in diameter sitting on an iron post about 3-feet high. The equatorial band has no engraved or embossed time marks, but the simple rod gnomon has two side rods. According the the WPL website, "Time on the sundial is read by looking at where the gnomon shadow is cast. This shadow will be the middle, thicker shadow of the three shadow-lines ... Although hours are not marked off on this sundial, you can estimate the time of day by thinking of the gnomon shadow hoop as the clock face and the shadow as the hour hand of that clock." Well, not exactly. The hours are at 15-deg intervals with 12 noon at the bottom of the equatorial band at the intersection of the meridian band. This armillary is more of a sculpture than a timepiece. Yet the armillary has the traditional tropic of Capricorn and Cancer bands as well as Arctic, Antarctic,and horizontal bands. A large 62 foot diameter horizontal sundial of grey concrete and brick with a 10 foot high steel gnomon. The dial was designed to memorialize the victims of the 9/11/2001 terrorism and includes four inlaid plaques on which the gnomon shadow falls at 8:45, 9:03, 9:37 and 10:07 AM, the times of the four air crashes. Hour markers are inset brass Roman numerals. The hour lines and NESW compass rose are 2 inch wide inset brass strips. This horizontal dial sits on a low concrete dais 13 feet in diameter. At the interior is an oculus 3 feet in diameter with loose gravel from which a 10-inch I-beam gnomon emerges. The I-Beam extends approximately 4 feet into the air with the north end cut vertical to the ground and then canted back creating a graceful taper on the underside. The dais concrete is of two colors: an inner pink ring 9 feet in diameter and an outer earth-toned ring that serves as a 2 foot wide chapter ring.